United States-based manufacturer Velocity Micro has announced two new budget Android Gingerbread tablets as part of its Cruz lineup of eReaders. First up is the Cruz T408, an 8-inch tablet with a single-core 1GHz Cortex-A8 CPU, 512MB RAM, 4GB SSD, Wi-Fi, microSD reader, front facing camera, and an 800x600 resolution capacitive touchscreen. 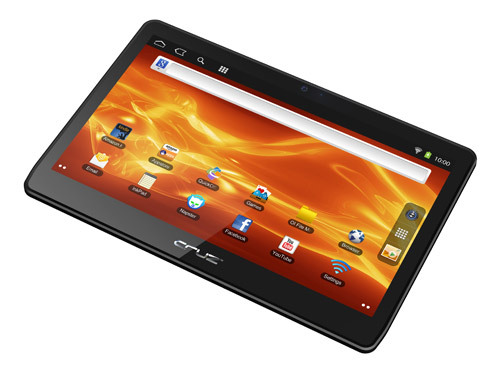 The tablet will include Flash 10.3 support and come preinstalled with a number of useful apps including Android Kindle, Amazon Appstore, QuickOffice and even Angry Birds Rio. MPEG-4, FLV and H.264/H.263 video files should play with no problems on the tablet. Meanwhile, the Cruz T410 is the 10-inch variant of the T408, but with a widescreen 1024x600 resolution display. Otherwise, the specs and installed applications are similar to its smaller sibling. Late last year, Velocity Micro released two 7-inch Android tablets that could be considered predecessors to the newer lineup. The T408 and T410 tablets will retail for $239 (170 Euro) and $299 (212 Euro), respectively. Both will be available before the end of this month. Check out the official product page here.